3G Auction has reached its last leg with only 2 days remaining for the close. As of Day 23 of 3G auction, the overall bids have reached 11,327.44 crore, up 223.64 per cent from a base price of Rs 3,500 crore. The total revenue today reached is in excess of Rs 45,500 crore. Total of 132 rounds of bidding were completed today. In the remaining two days Government is expected to garner 50,000 crore mark, nearly 5k crore above the current price. Mumbai circle still remains the front runner with a bid price of 1986.69 crores followed by Delhi at 1920 crore. 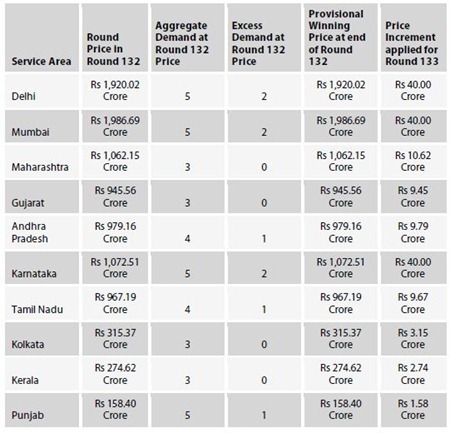 Among the states Karnataka managed to pip Maharashtra to take on the 3rd position with bid price of 1072.51 crores. Maharashtra has bid price of 1062.15 crore followed by Andra Pradesh at 979.16 crore. 2 Metro (Mumbai & Delhi) and 5 states (Maharashtra, Tamil Nadu, Gujarat, A.P & Karnataka) account for more than 80% of all the Auction bids placed.